Safely remove bugs, tar, and tree sap without scratching! Remove bugs, tar, and sap from automotive glass with the Diamondite Zip Sponge Bug & Tar Remover. The open-cell foam sponge has honey-comb chambers to gently separate sticky contaminants from the glass and completely remove them. The Diamondite Zip Sponge Bug & Tar Remover leaves glass clean and scratch-free. 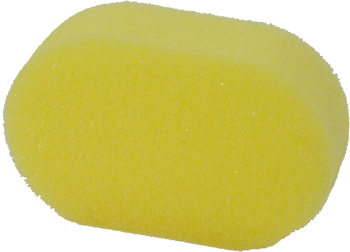 The Diamondite Zip Sponge Bug & Tar Remover is made of open-cell foam. The small, rigid cells gently scrub the glass surface to remove bugs, tree sap, and contamination with the help of soapy water for lubrication. When used with a lubricating wash, the Diamondite Zip Sponge Bug & Tar Remover is completely safe on windshields and windows. To soften the foam, soak it in warm water for 3-5 minutes before use. The soft foam bends against the glass, rather than remaining stiff, so scratching is virtually impossible. The Diamondite Zip Sponge Bug & Tar Remover has small pores that safely glide over the glass, picking up foreign contaminants and trapping them inside the sponge where they cannot scratch the surface. The foam softens when wet so always use a lubricating car wash to protect the surface being cleaned. The Diamondite Zip Sponge Bug & Tar Remover also works on paint, metal, and plastic. The flexible foam is even safe on chrome. Diamondite Zip Sponge Bug & Tar Remover even removes fresh mineral spots (those that haven’t yet etched the surface). Spread Diamondite Glasswork Restorer over desired area with the sponge and rub back and forth using light pressure. The light abrasive action will remove the minerals and clarify the glass. Buff with a soft, clean Cobra Microfiber Towel. The Diamondite Zip Sponge Bug & Tar Remover makes it easy to remove the most stubborn contaminants from automotive glass, chrome, paint, and plastic. Add it to your car care arsenal to maintain clean, clear glass.